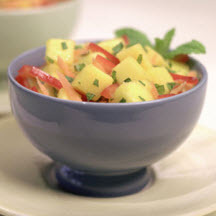 This mango fruit medley is an easy dish to prepare and goes great with grilled meat or fish. *To Peel a Mango: Stand the mango on end and slice down along the sides of the large flat pit with a boning knife or other long, flexible knife, curving around the pit as you slice. You will end up with three sections: two larger, rounded sections and a flat center section. Score the fruit in each rounded section lengthwise into slices, then crosswise into chunks, if desired. Holding a rounded section by its edges, push at the curved bottom to turn the rind inside out. The slices or chunks can then be cut away from the rind. Trim away rind from the flat center section and separate as much fruit as possible from the pit. Always cut away from yourself and be careful—mango is very slippery.